Benjamin Schmid and Ariane Haering are a formidable pairing who live and breathe these scores as one, matching even the most subtle of dynamic and phrasal inflections to a remarkable degree. In Liszt’s Grand duo concertant, Schmid’s captivating range of sonorities is matched throughout by Haering’s golden touch – her gently rippling asides in the second variation ravish the ear, while in the notorious tarantella fourth variation and marziale finale, both artists infectiously convey their shared delight in the music’s exuberant invention. No less striking is Nathan Milstein’s fine transcription of Liszt’s Consolation no.3, which sounds as if it were a fresh musical discovery in this meticulously balanced recording. This fine duo’s ability to draw the listener in as though they are sharing private confidences reaches its apex in Bridge’s 1904 Sonata, Romanze and Heart’s Ease, all of which possess such heightened sensitivity to harmonic inflection and musical line that one senses a Delian impulse colouring the music’s distinctive chromaticism more strongly than usual. Perhaps a more free-flowing, heroically rhetorical approach to Grieg’s popular C minor Sonata might have paid even greater dividends, but with playing as disarmingly poetic as this, it is difficult not to be seduced into the pair’s exquisite sound world whatever one’s preconceptions. 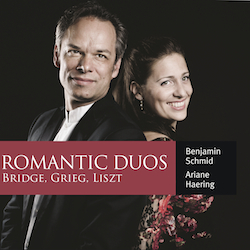 The husband and wife team of violinist Benjamin Schmid and pianist Ariane Haering are in superb form on the CD Romantic Duos, featuring works by Franz Liszt, Frank Bridge and Edvard Grieg (TwoPianists Records TP1039299). Schmid’s tone throughout is rich, warm and full-blooded; Haering is a true partner with a beautiful piano tone, and the balance and sound quality are perfect. Although usually attributed solely to Liszt, his Grand Duo Concertant was actually a collaborative effort between Liszt and the violinist Charles-Philippe Lafont, whose Romance, Le Marin is the basis for a set of short variations. It’s a lovely work. Liszt’s brief Consolation No.3 was originally one of six solo piano works, and is presented here in a transcription for violin and piano by Nathan Milstein. The English composer Frank Bridge only published one acknowledged violin sonata, in 1922, but there is an incomplete sonata that pre-dates the Great War, comprising an opening movement and an unfinished second movement. It is this work that is recorded here, with the second movement completed by the Bridge authority Paul Hindmarsh. It’s a beautifully rhapsodic work that draws terrific playing from the performers. Two short pieces by Bridge are also included: Romanze, from 1904 (the same year as the unfinished sonata); and Heart’s Ease, written in the early 1920s. A passionate performance of Grieg’s Violin Sonata No.3 in C Minor, Op.45, completes an outstanding disc. This CD is the result of many years of Duo-playing with my wife Ariane Haering. We met through music and eventually became married in 2004; since then we share our time between concert tours and bringing-up our four children. And music remains one mesmerizing field for development in our professional and personal life; it interacts so wonderfully with all the other parameters in our life - we cherish this possibility to reflect on human life through a nonverbal, almost global language more than ever, and the art of Duo playing reflects exactly that: it is the most personal way of making chamber music. The pieces recorded on this CD by Liszt, Bridge and Grieg are at the core of our repertoire, for several reasons: Liszt for its well balanced virtuosity and artistry on both instruments, Bridge for being a fantastic discovery of an unknown masterpiece of late Romanticism, and Grieg for representing one of the most perfect sonatas ever written for violin and piano. After so many performances, we felt very happy to record those pieces and are especially glad to add three small jewels, “Consolation” by Liszt/ Milstein, as well as the exquisite “Romanze” and the most intimate “Heart ́s Ease” by Frank Bridge. We believe to present a balanced collection of well known and rather rare but supremely attractive discoveries, so that one hour of music listening passes by both romantic and refreshing. Enjoy!